Manufactured in heavier gauge material to British Standard BS2037 - 1994 Class 1. For heavy duty industrial use. All steps fitted with rubber studs to base of back legs and sides. Maximum load capacity - 175kg. 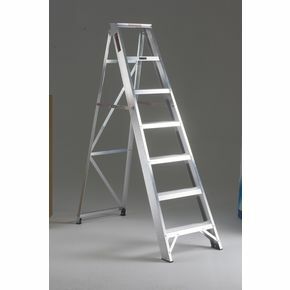 If you are looking for a reliable ladder for heavy duty industrial use, choose our heavy duty swing back steps. 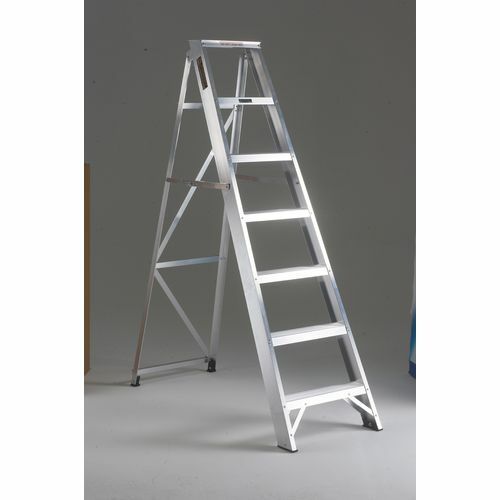 Manufactured in heavier gauge material to British Standard BS2037-1994 Class 1, these ladders are specifically designed for use in industrial environments. All of our steps are fitted with rubber studs to the base of the back legs and side legs to give them extra grip to the floor making them sturdier on slippery surfaces. They are available in a choice of eight open heights; 0.65m, 0.87m, 1.11m, 1.34m, 1.57m, 1.8m, 2.04m and 2.33m, giving you plenty of options to find one to suit your working needs. These study steps will give you all the support you require with underfoot grip and comfort while standing and working at height. Our heavy duty swing back steps are ideal for industrial use, including maintenance work, allowing you to be confident and at ease when working at high above ground level. They come with a 12 month guarantee and FREE UK Delivery.